My next stop brought me to the London Language and Drama School where training in the English language occurs through theater training technique. Located in a suburb of London, the school offers students an array of interesting drama and speech courses developed for English language training. For students who wish to develop theater skills beyond simply good, fluent English, the London Drama School offers a one-year acting course where students take improvisation, text work, mime, acting for TV and film, dance and movement, singing, and even voice over workshops. They study Shakespeare, Restoration Theater, and Stanislavski. Finally, they are trained to audition for the West End stage and have showcases for West End theaters at the end of the course. 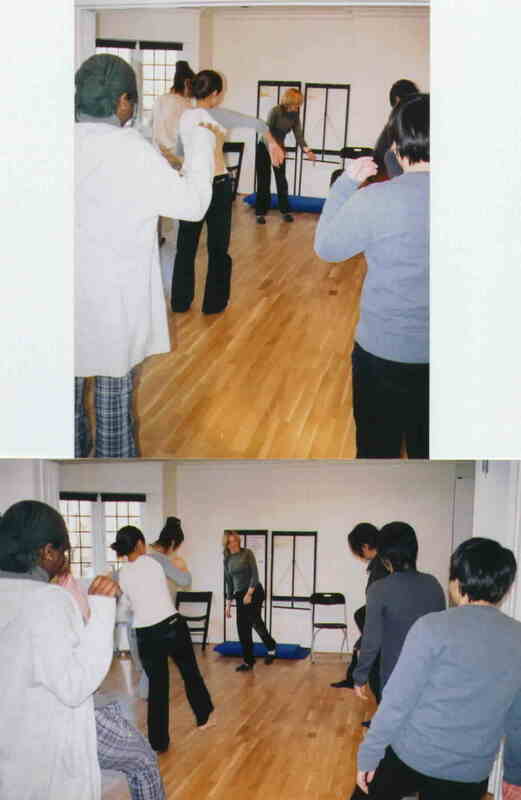 But my interest was in how the instruction in drama was integrated with the regular ESL/EFL program. For those working on their English language skills, the Language School offers two levels of Drama and Theatre Studies: foundation and advanced. The foundation course includes: voice production and breathing, articulation, modulation, poetry reading, improvisation, communication, physicality, sight-reading, concentration games, creating a character and mime. The advanced level offers text analysis for character development, animal study, sense memory, voice production and verse, psychology of character, acting styles, improvisation, writing of short plays, and audition technique. A separate course is called "Received Pronunciation and Speech Training." This is a full-blown speaking course that incorporates relaxation techniques with voice and pronunciation exercises. Using the famed, Alexander Technique, the course starts with body posture to control projection, works with breathing and voice to produce clarity of vocal expression, and leads to work on developing range, resonance, and vocal tone to bring language to life when delivering text. It was my privilege to observe a Language Development Technique class (this class, taken every day and shortened to LTD is right after the daily English Language Structures class) and the Drama or, on this day, the Scene Study class (offered for three hours on Wednesday and Thursday afternoons). The language development class is taught by Zane Stanley, himself an actor as well as a language instructor. The course is really a reading course that trains the student to read with expression while at the same time getting to know, pronounce, and to use new vocabulary with ease. Zane started the class with a vocabulary exercise where students were given a meaning to which they would have to attach words. Through guessing, the students got to understand the new vocabulary that came from their reading (as yet unseen by the students). After arriving at the new vocabulary word orally, with a lot of time spent on correct pronunciation, Zane wrote out each new vocabulary word on the board for spelling and included a written definition which the students wrote down. After illuminating all the vocabulary in this fashion, he then read the whole passage with great expression and clarity of diction. He then handed out the short, two-page piece for the students to examine and prepare for their own reading. After the students had had a chance to read the passage quietly to themselves, each student was given opportunity to read half of the passage. They aimed at expressing the meaning in a smooth and dramatic way. I was amazed. Instead of reading the passage in a faltering and hesitant fashion as many intermediate level students are prone to do, these students read in word groups, were careful of phrasing and intonation and stress. They read like announcers and with clear articulation. Of course, some new words were mispronounced, but by the end of the class, the final readers had these under their belts and were pronouncing them "trippingly on the tongue" as Hamlet would say. "Now THAT'S a reading class!" I said to myself. As I reflected on Zane's method, there occurred to me at least three techniques that were effective in producing such superior results. The first was the use of questions to arrive at the vocabulary word that was then pronounced over and over until the students "got it" through listening, looking at the speaker's lips and mouth, and repeating. Only after it was easily pronounced, was it written on the board. The second effective technique was to read the passage to the students before they had a chance to see it. This modelled the pace, phrasing, intonation, and stress for the students while they were passively listening. Finally, the third technique of giving each student a full page of text to work with to develop a reading that was expressive of the meaning and to have students repeat the reading five times (there were ten in the class) seemed especially important to the process of developing ears that hear the music and the rhythm of spoken English and tongues that can deliver it. Well done, Zane! The afternoon drama class was equally inspiring. 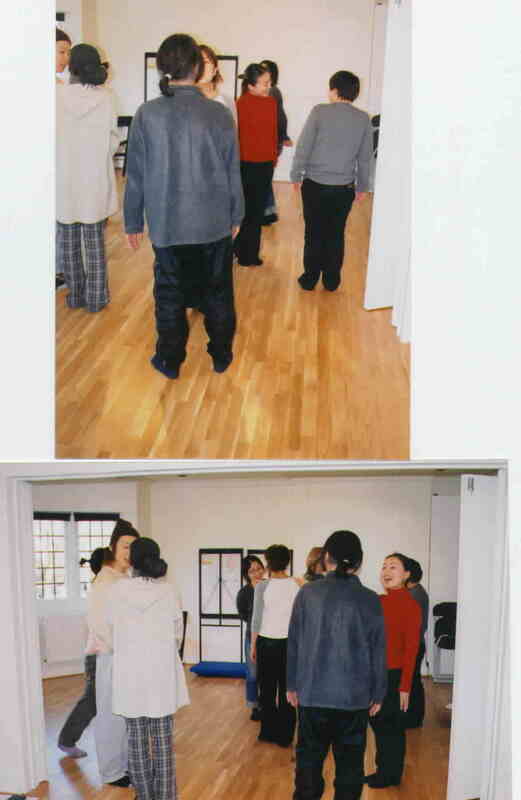 Led by Lucinda Cowden, an actress and language teacher from Australia, the class began with physical warm-ups and relaxation exercises followed by a vocal warm-up and exercises. 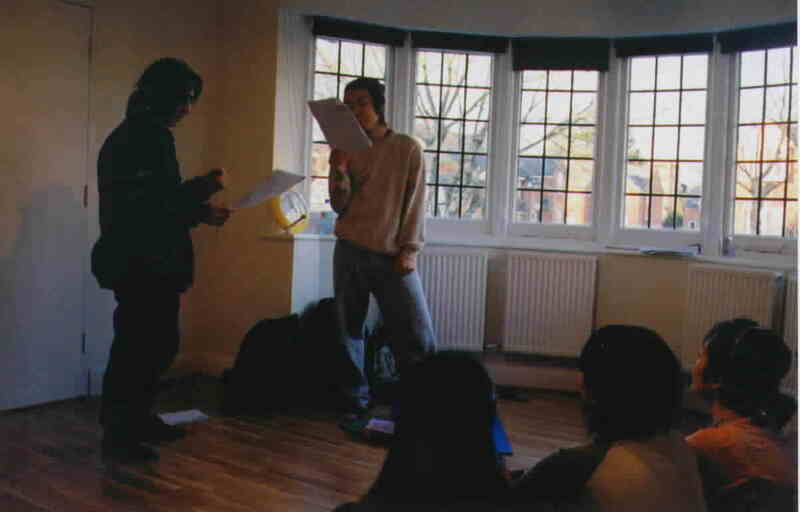 After warming up individually, students engaged in several exercises where they talked with each other in pairs or small groups and worked with developing articulation and posture related to the kind of speech they were using, in this case, very exaggerated Victorian English for they were about to work on their scenes from The Importance of Being Earnest. Once warmed up, the students divided into pairs to work on their scenes. First, they looked over the scene line by line and, after determining the character objectives, they improvised the dialogue, paraphrasing each exchange. In this way, character intention was developed and the understanding of the character objective revealed. While working and discussing, the students all used English. They didn't revert to their first language at all, although most were Japanese. The teacher then went round the room and worked with one group at a time, explaining the meaning of words, phrasing, and figures of speech. She coached the students, spending much time on pronunciationa and intonation, working with full stops, and she modelled, sometimes word by word. The classroom had only a small white board and nothing was written. This work was all verbal, so the students had to listen carefully. All were spread out on the floor. After going from group to group and making sure that each student knew their character's intentions, Lucinda had the two men read their scene for meaning and intention while all the students listened and watched. After the reading (all scenes are short, only two pages) the entire class discussed the scene and the character relationships. Then the girls read through their scene with the same discussion after their reading. The class then separated and went to different areas of the large room to work on developing movement to go with their dialogue. Each pair spent about half an hour rehearsing their scene with lines and movement. They then returned to the center of the room to do their scenes with movement. As the rest of the students formed an audience, two girls read through their scene. Lucinda stopped them to work line by line on the subtext. She wanted to make sure that the actresses understood what their characters were thinking at every moment underneath each phrase. This exercise was revealing. As each phrase was examined for motive, a book of culture, history, and manners emerged. To understand what a character is saying, the actress must understand the historical and social context of her character as well as understand what her character wants to do and why. And what a lot of examination of culture comes from this! It occurred to me that this must be one of the best ways of teaching culture whilst not appearing to do so! Finally, once the understanding of what was being said and why was determined, the students worked through again adding their movement as extension of the lines. Time was also spent on getting the pronuncation just right for the period and the style. And in no time, the class was over. I was left with two certainties after having watched the class. The first certainty is that work with subtext is one of the very best ways to teach culture as students must draw upon an understanding of cultural norms and manners and expectations in order to develop their characters. The other is that we really must get out of the habit of placing chairs in our language classrooms! Students need space to spread out, to move, to physicalize their thought and speech. We are too used to containing our students in unnatural spacial fields that in itself leads to a petrification of natural speech. When we open the space, we open our students' ability to integrate their new language with their whole sense of being themselves. I think the following pictures illustrate well the natural flow of the drama class. Working individually with students in coach fashion, Lucinda Cowden stresses the importance of subtext to produce understanding of character and culture. She also models pronunciation, phrasing, and the rhythm of the language. The Scene Takes on Movement and Life! to see what she was doing at Drexel University in Philadelphia. Click on the link below to find out.